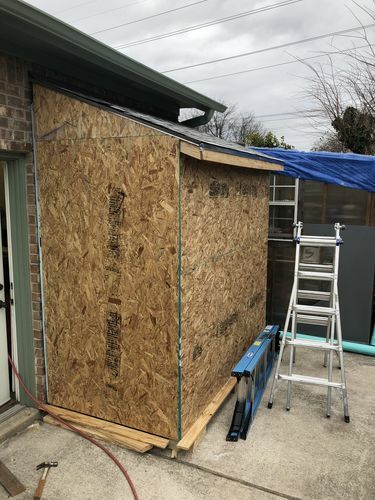 Dust Collector Shed #2: We have a door! Wow. People actually read my first blog post. Not sure I was expecting that. Thanks to all that read it and a special thanks for those that commented. Before we continue, here are a few photos of it in progress. When we last left the shed (and when I say ‘we’ I mean ‘me’), the shingles were up the OSB in place and three walls were wrapped in Tyvek. The next thing needed was a door! 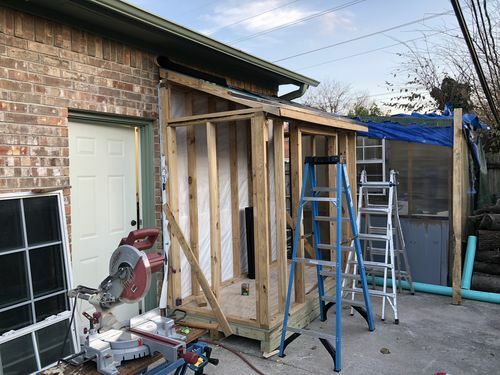 I purposely covered the entrance when I put up the OSB. 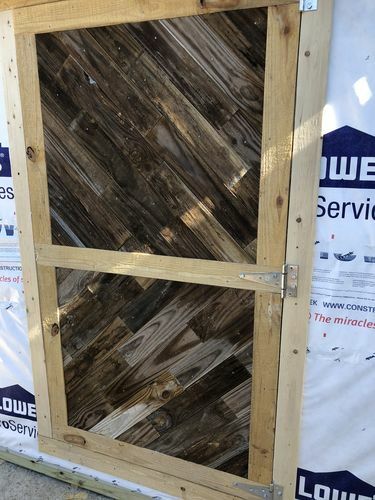 I built the door structure and installed it on the inside of the front OSB before I installed the last side. When I installed the door, I drilled a 1/2” hole in each corner of the door jamb as guides for future cutting. So the plan was to locate the four holes, connect the dots, measure out 1.5” from each side and cut along the lines. Of course, nothing goes quite as planned. My first mistake was that I went 1.5” from the verticals, but not from the top and bottom. But in hindsight, I am okay with cutting the top and bottom where I did. I still have the overlap on the sides, which will seal the door nicely. Once the lines were drawn I put up a 1X4 trim. I used this to guide my circular saw. With the verticals cut, I installed the hinges. Three hinges with three lags in each. Worked like a champ. I then cut the top and bottom. Then viola! The door wouldn’t open. I recut, made deeper cuts, and even went to the arbor on each corner to make sure the cut went all the way. The door still would not open. One corner flapped a little, so I know my theory worked, but the door stood fast. 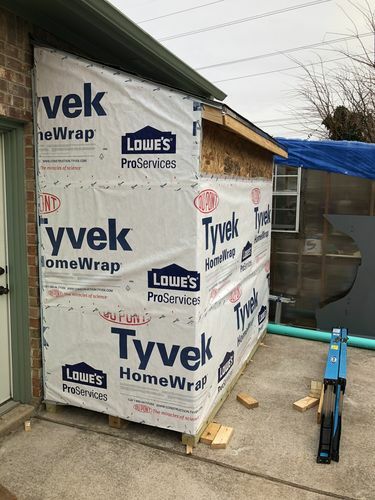 Frustrated, I lifted the Tyvek and cut an access hole to crawl through. I then kicked the beast until it opened. Seems that I nailed the OSB in the 1.5” area. Just enough to keep the door from opening. A multi-tool made quick work of the offending nails. With the door finally mobile, I added more lags to the hinges and what do you know — the door wouldn’t open again. Back through the hole I went and more force, and the entire jamb came off. The added lags went into the jamb. I cut the nails, and will fix it later. 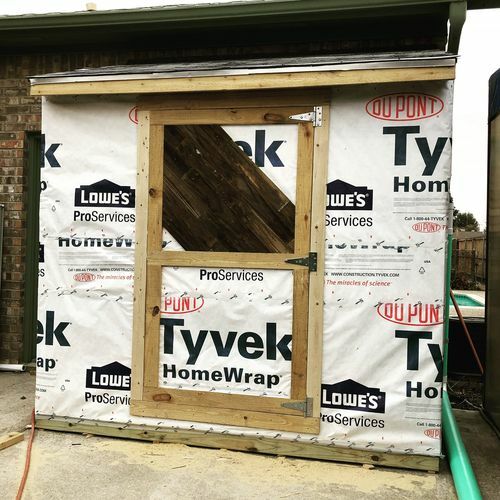 A storm was coming in and I wanted to make sure to get some siding on the door to keep the Tyvek in place. I played around with the old fencing wood and decided on a diagonal pattern for the door. I got most of the top and some of the bottom in place—not shown in photo— (and even re-attached the access hole piece) before it got too blustery and cold to continue. Here is how it mostly remains now. I took some time this morning to finish the door. I think it turned out nicely.